The burglaries across Newmarket, Mildenhall, Haverhill and surrounding areas are being linked by police due to the similarities in their nature. The typical features of these break-ins is that they usually take place between 5pm in the afternoon and 9pm in the evening, involve forced entry to the property and with jewellery and cash the main target for the criminals. Police are asking people to be on the look-out for any suspicious behaviour in their neighbourhoods. This is an alarming amount of burglaries, causing misery and distress to a vast number of individuals and families across the county. We are pursuing a number of lines of enquiry in relation to these burglaries, but the vital key to catching these criminals could be provided by a member of the public calling us with information about something they have seen and believe to be suspicious. The world-renowned Mildenhall Treasure - made up of 34 pieces of Roman silver - was discovered in the 1940s... but not in Mildenhall. Police in Mildenhall, Suffolk have released this image of a van badly damaged after it was hit by a lorry while broken-down. Owners of flats in a converted Suffolk vicarage are angry at a big hike in service charges. They say it is 4 times more than last year. In a week when concerns have been raised about the British military's ability to react to a major crisis, the United States Air Force in this region has been showing its own state of readiness. The 100th Air Refuelling Wing which is based at Mildenhall provides inflight refuelling for all US and NATO forces in Europe and Africa. The KC135 carries up to 30,000 gallons of aviation fuel. "It takes a lot of planning, a lot of training, a lot of hard work, not only by the aircrews, but by the maintainers to have the aircraft ready to go and every organisation within the wing." 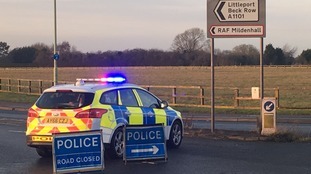 A man arrested following an incident at the US airbase at Mildenhall in Suffolk has been detained under the Mental Health Act. 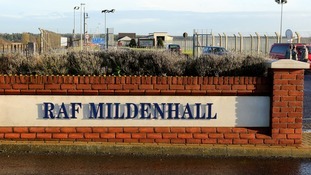 Suffolk police say a 44-year-old man arrested in connection with an incident at the US airforce base at RAF Mildenhall on Monday has been detained under section 136 of the Mental Health Act. The British man was arrested on suspicion of criminal trespass and criminal damage. Shots were fired by US service personnel and the airfield put on lockdown after reports of a disturbance. Superintendent Kim Warner, of Suffolk Police, said a vehicle failed to follow security directions at the entrance and drove on to the base. There was a "short pursuit" and the vehicle was stopped by US security services, he said. Suffolk Police say an incident at RAF Mildenhall is not being treated as terrorism. A 44-year-old British man was initially arrested on suspicion of criminal trespass. The man, who suffered cuts and bruises in the incident, has been taken into custody. Police are not looking for anyone else on the site in relation to the incident. RAF Mildenhall went into lock down after the incident. Suffolk Police say the incident remains an active police investigation at this time and enquiries are on-going. Shots were fired by US service personnel and a man has been detained after a disturbance at RAF Mildenhall, Suffolk Police said. Police in Suffolk have confirmed they're dealing with a "significant incident" at RAF Mildenhall. A five-year-old boy from Isleham in Cambridgeshire has had his dream come true after spending a day as a US airpilot at RAF Mildenhall. Jay Martin was diagnosed with brain cancer in January. He's still undergoing chemotherapy, but that's not stopping him getting through his bucket list. How should land at RAF Mildenhall be used?